Automate payments and earn revenue. Easily customized for your business, the CommercePayments™ AP Card works with your existing accounting system and provides an opportunity to earn monthly revenue share by replacing paper checks with electronic payments through the card networks. 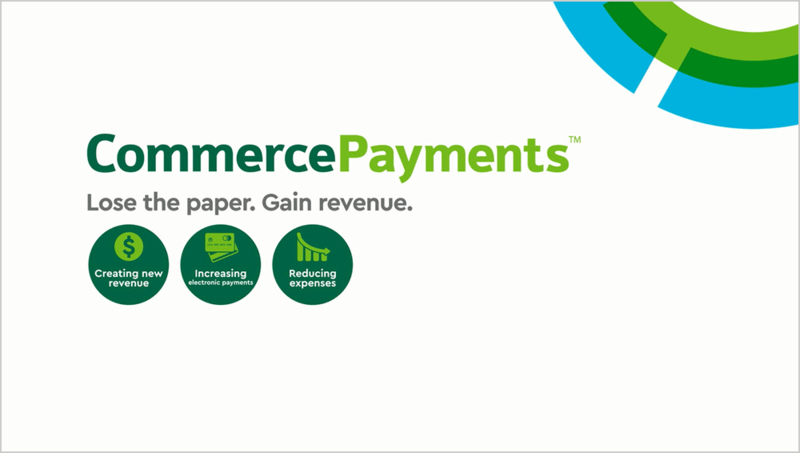 As a flexible payment management program, the CommercePayments™ AP Card supports automated accounts payable and purchasing with a single application and provides your organization operational efficiencies, enhanced controls and detailed reporting. Create a new revenue stream for your business while reducing operating costs, minimizing risk and maximizing float time. Whether your company pays suppliers on a regular schedule or needs to accommodate one-time payments and point-of-sale purchases, the CommercePayments™ AP Card program's multiple acceptance options fit your suppliers' payment needs and maximize your card volume and overall revenue share potential. Supplier enrollment that doesn’t quit. Other providers offer higher revenue share percentages at the cost of little enrollment – a common mistake that should be avoided. At Commerce Bank, we do the heavy lifting. Our enrollers will help you get your program up and running by contacting your suppliers to set them up quickly and effortlessly with the payment option of their choice. Enrollment is continuous through the life of your program as we help your business execute long-term payment strategies for growth.